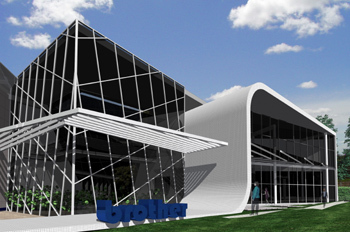 This commercial project was a design for the next headquarters of Brother International in Australia. 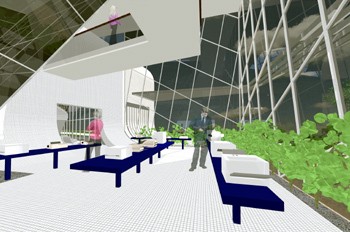 The design was halted at design stage due to corporate re-structuring. 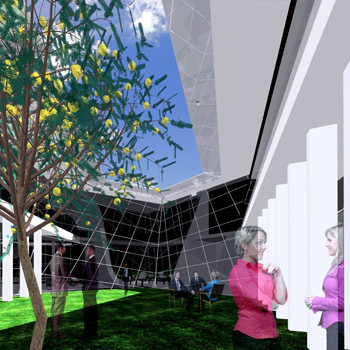 Design features include areas for product and technical support, sales and marketing, human resources, finance, IT, spare parts, offices, warehousing as well as a distinctive glass encased product showroom. Providing a new green corporate look, the curved nature of the walls reflected the flexible nature of the company that produces many types of domestic and commercial products. The product showroom was to be glass-encased for complete visual accessibility both internjally and externally. The staff courtyard is an informal meeting area and a place to bring clients and corporate functions. The inside of the product showroom is complete with angled glazing panels and a bridge above connecting the management team with its products. 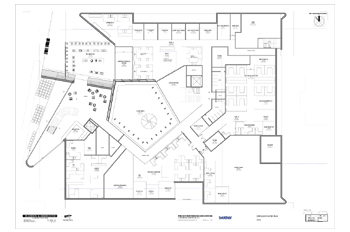 In addition to the Ground Floor Plan there is basement parking and level one office area. More information is available upon request.